There are times when even the most dedicated machine sewer needs or wants to do some hand-work on a project, and it's useful to have a repertoire of stitches for different purposes. Catchstitch is a row of Xs on the wrong side of a garment and two lines of straight stitches on the right side. It holds two flat edges together and is flexible and strong. Slipstitch is a hidden stitch used to join two layers from the right side together and is also used for hemming and finishing garments. 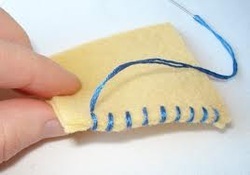 Whipstitch is a sturdy and visible stitch used for hemming and sewing seams. 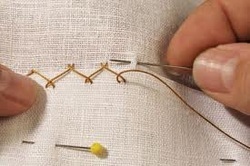 Running stitch is an even stitch that is used to join two layers together and is meant to be permanent. Basting stitch is an even stitch that is used to temporarily join two layers together. It is like the running stitch except the stitches are longer and wider apart. The blanket stitch is a decorative stitch to finish either a raw edge. Work the stitches evenly, and as closely together as necessary to cover the raw edge. The buttonhole stitch controls fraying as well as creating a decorative edge. 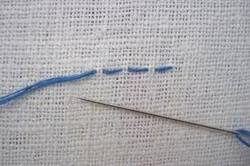 Put the needle under and through the fabric edge; loop the thread around the needle point, and pull the needle through. 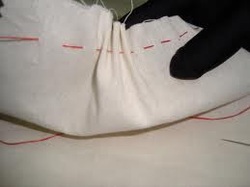 Tighten the thread, positioning the "knot" of the stitch at the fabric edge.